A preconfigured WINE wrapper for Linux is available for the GOG release. Star Wars: Galactic Battlegrounds Saga includes the base game along with the Clone Campaigns expansion. 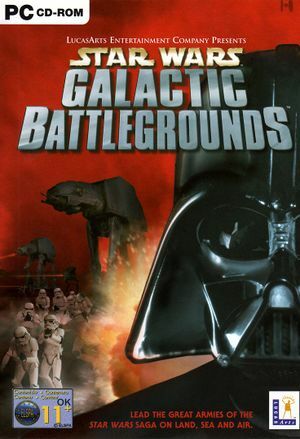 The digital releases use the background music from the original release, rather than the Galactic Battlegrounds Saga re-release. The background music used in Galactic Battlegrounds Saga, formatted for use in-game, can be downloaded from the PCGamingWiki community site. Included on second disc of some releases of Clone Campaigns. Requires Clone Campaigns. Further patch details, download links, and support can be found on the official Steam Community page. Create a new shortcut directly to battlegrounds.exe, or battlegrounds_x1.exe for Clone Campaigns. player.nfx is for the base game while player.nf1 is for the Clone Campaigns expansion. See Widescreen resolution. Pixel-based scaling; Lossless Scaling in conjunction with Expanding Fronts set to 1920x1080 and windowed mode can help. Uses 2d sprites. Real estate is increased with higher resolutions. In Expanding Fronts, enable windowed mode and set window resolution to the desktop resolution. Animations play at 20 FPS. The Expanding Fronts mod can speed up animations to 60 FPS. 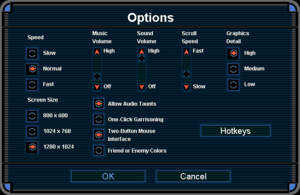 Enable Friend or Enemy Colors. Expanding Fronts also adds larger text support. A No-CD executable is required for this. Note that the GOG.com version already ships a decrypted binary and does not require such. This fix is already included with the Star Wars: Galactic Battlegrounds All-In-One Patch and Expanding Fronts. Download the fix from here. Go to <path-to-game>\Star Wars Galactic Battlegrounds\Game. If you're using the GOG.com version, extract the contents from the GOG folder in the archive to that folder - for all other versions use the CD folder. Run the SWGBWide_x1.exe executable and the patch will apply. Should you not be able to select a resolution of 1280x1024 in the options, run the game from wide_battlegrounds_x1.bat instead. Scroll speed can be adjusted. The game has subtitles for all the dialogue in-game; the campaign intros also have subtitles. Requires the Star Wars: Galactic Battlegrounds All-In-One Patch. Zone.com support has been discontinued. Mac OS and OS X only. Adds 2 new factions (Geonosisians and Zann Consortium), expanded vanilla factions, a handful of custom map randomizers, and an expanded map editor. Uses a separate executable from vanilla (battlegrounds_x2.exe). This means it doesn’t interfere with a vanilla installation, however, it needs to be renamed to launch with Steam/Galaxy or use online multiplayer restoration tools. Includes native widescreen support, and a windowed mode option through an external configuration tool. The aforementioned configuration tool can also speed up animations to 60fps, as well as other experimental features such as large map support and larger fonts for some text. Configuration data for Expanding fronts is stored in <path-to-game>\Game\player.nf1 and HKEY_CURRENT_USER\Software\LucasArts Entertainment Company LLC\Star Wars Galactic Battlegrounds: Expanding Fronts\1.0. 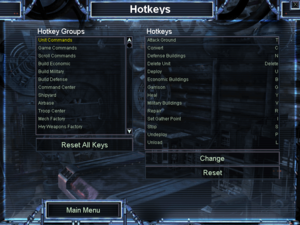 Changes made in the external configurator are stored in HKEY_CURRENT_USER\Software\LucasArts Entertainment Company LLC\Star Wars Galactic Battlegrounds: Expanding Fronts\Configurator. A higher resolution icon for this mod can be found here (choose battlegrounds_x2.ico. ↑ 3.0 3.1 File/folder structure within this directory reflects the path(s) listed for Windows and/or Steam game data (use Wine regedit to access Windows registry paths). Games with Steam Cloud support may store data in ~/.steam/steam/userdata/<user-id>/356500/ in addition to or instead of this directory. The app ID (356500) may differ in some cases. Treat backslashes as forward slashes. See the glossary page for details.